Formulated with 100% acrylic latex, Exterior Satin Enamel features a pearl-like sheen, making it ideal for wood siding, doors, trim, railing, shutters, overhangs and outdoor furniture. This mildew-resistant finish offers improved hiding for greater coverage and provides ultimate durability. Glidden Premium semi-gloss interior paint with primer offers exceptional value and a quality finish that helps beautify your high-traffic areas including trim, kitchens and bathrooms. Glidden Premium is a Zero VOC, Low Odour paint with primer that features good hide and coverage, a scrubbable and washable coating and a thick, easy to apply formula - all backed by a Lifetime Guarantee. Glidden Premium provides a mildew resistant coating that can be tinted into more than 1,100 Glidden colours and is formulated for lasting results, often for less than other leading brands. For more than 140-years, painters have trusted Glidden and Glidden paints to help them turn inspiration into action to add colour to their lives and Glidden Premium delivers on this tradition with a durable finish at an exceptional value. Colourants added to this base paint may increase VOC level significantly depending on colour choice. Glidden Premium flat interior paint with primer offers exceptional value and a quality finish that helps beautify your low-traffic paces such as bedrooms, dining rooms and formal spaces. Glidden Premium is a Zero VOC, Low Odour paint with primer that features good hide and coverage, a scrubbable and washable coating and a thick, easy to apply formula - all backed by a Satisfaction Guarantee. Glidden Premium provides a mildew resistant coating that can be tinted into more than 1,100 Glidden colours and is formulated for lasting results, often for less than other leading brands. For more than 140-years, painters have trusted Glidden and Glidden paints to help them turn inspiration into action to add colour to their lives and Glidden Premium delivers on this tradition with a durable finish at an exceptional value. Colourants added to this base paint may increase VOC level significantly depending on colour choice. 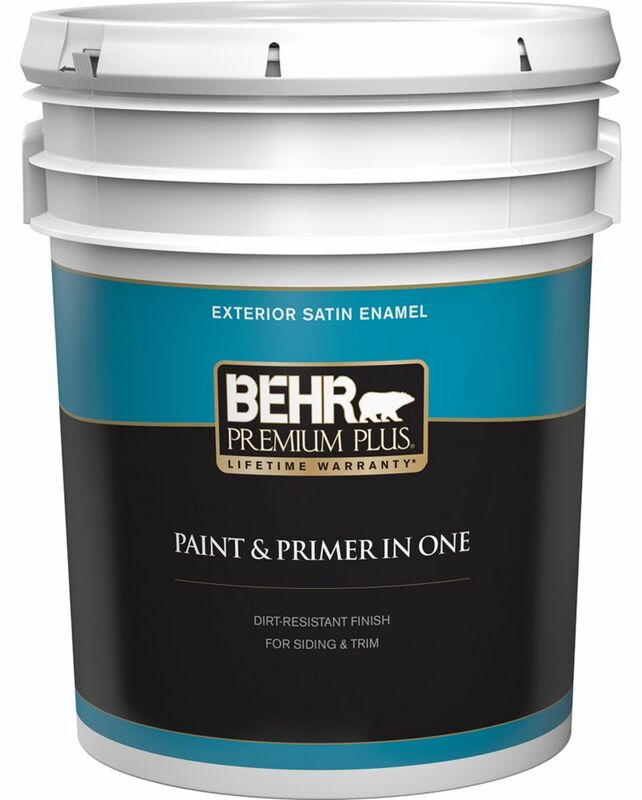 Exterior Paint & Primer in One, Satin Enamel - Ultra Pure White, 18.9 L Formulated with 100% acrylic latex, Exterior Satin Enamel features a pearl-like sheen, making it ideal for wood siding, doors, trim, railing, shutters, overhangs and outdoor furniture. This mildew-resistant finish offers improved hiding for greater coverage and provides ultimate durability. Exterior Paint & Primer in One, Satin Enamel - Ultra Pure White, 18.9 L is rated 4.9 out of 5 by 155. Is this product tintable ? Hi Sidecar! Thanks for your question. Yes, Premium Plus Paint can be custom tinted to match any color of your liking. Best of luck on your project! Best, Jeanette P.